Product prices and availability are accurate as of 2019-04-11 03:30:49 EDT and are subject to change. Any price and availability information displayed on http://www.amazon.com/ at the time of purchase will apply to the purchase of this product. Coriander (Coriandrum sativum), also known as cilantro, Chinese parsley or dhania, is an annual herb in the family Apiaceae. Coriander is native to regions spanning from southern Europe and northern Africa to southwestern Asia. It is a soft plant growing to 50 cm (20 in) tall. The leaves are variable in shape, broadly lobed at the base of the plant, and slender and feathery higher on the flowering stems. The flowers are borne in small umbels, white or very pale pink, asymmetrical, with the petals pointing away from the center of the umbel longer (5-6 mm or 0.20-0.24 in) than those pointing toward it (only 1-3 mm or 0.039-0.118 in long). The fruit is a globular, dry schizocarp 3-5 mm (0.12-0.20 in) in diameter. The seeds are generally used as a spice or an added ingredient in other foods or recipes, although sometimes they are eaten alone. All parts of the plant are edible, but the fresh leaves and the dried seeds are the parts most traditionally used in cooking. 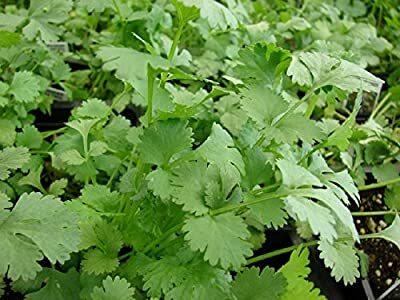 Coriander is common in South Asian, Southeast Asian, Indian, Middle Eastern, Caucasian, Central Asian, Mediterranean, Tex-Mex, Latin American, Brazilian, Portuguese, Chinese, African, and Scandinavian cuisine.